I started my lunch today planning to write a long and tedious blog about the UK Government release today, and I will get to that tonight perhaps, but I was overtaken by events; namely the shock announcement that Pope Benedict XVI has chosen to resign his position as the head of the world church of Catholics. This news appears to have stunned even those of the inner Vatican circle, especially given the long tradition and expectation of popes dying in office. In fact, we have to look back to 1415 to find a prior example, and that was a decision based on necessity to maintain the ministry. I confess myself to be somewhat flabbergasted, but I welcome the news with all the alacrity of hope for the future of the Church under a more progressive spiritual head. 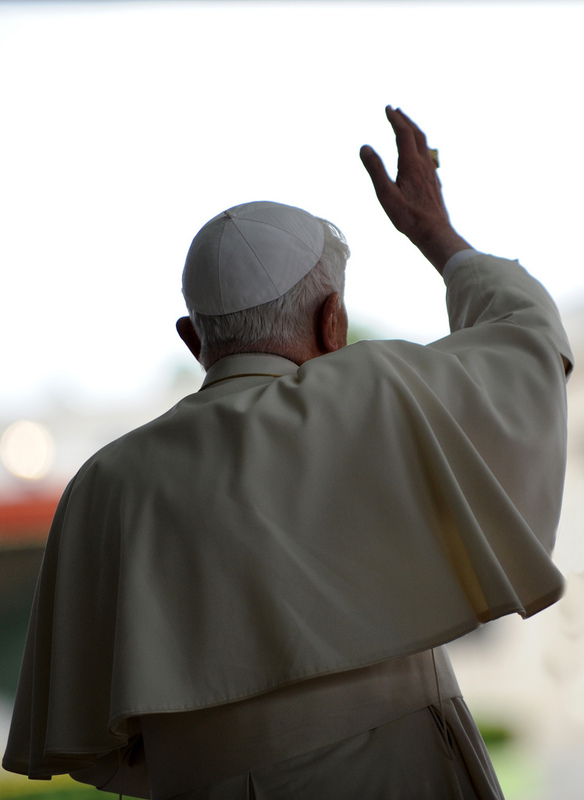 Pope Benedict XVI has taken an unprecedented and difficult decision to step down to allow someone else with more vigour of health to take on the shackles of the spiritual leadership of a ministry diminishing in many areas of the world. I’d assert that this decision was not made out of self-interest and concern for his own health, and his statement informs this position. He says, “After having repeatedly examined my conscience before God, I have come to the certainty that my strengths due to an advanced age are no longer suited to an adequate exercise of the Petrine ministry,” He clearly believes that this heady role can be more aptly filled by someone else more ably, if not more passionately. Much negative opinion has been written and spoken about Pope Benedict XVI, but I hope that this decision will receive a more charitable reception; an acknowledgment that he did the right thing. Pope John Paul II, for all the discussions and agreements in Vatican II had, in my opinion, a steely hold over the stagnation of the church in relation to suitability for purpose in a more tolerant, progressive world. And yet was beloved. Not only beloved of Catholics, but as an acceptable face of Catholicism the world over. He was fêted by Catholics in his adopted country of Italy; idolised in his native Poland and his message was welcomed with great joy in certain Latin American countries during times of great hostility to Catholic Churches there. He was even welcomed with open arms and benevolence and love by most of Scotland’s Catholics in his visit in 1982. When John Paul II it died was an opportunity for the conclave of Cardinals in the Catholic Church to take a different approach; to recognise that their ministry was further changing, that the responsibility which they held was not only to uphold the values of the Catholic Church, but to guide the people they served. Whilst Il Papa was alive, they couldn’t make necessary changes, but here was an opportunity and they fell at the first hurdle. Vatican II was attempt to address the position of the Church in the modern world. There is much argument about the efficacy of the changes which Vatican II made during the period of 1961-1965, but what is clear is that the Catholic Church moves at a much slower pace than society. For most, the values of modern society have progressed quite significantly since 1965 and the Church isn’t so much playing catch up as still to set off; adhering very strictly to unchanging central tenets. Joseph Ratzinger, as was, took part in the original opening session of Vatican II in 1961, as did the then Karol Wojtyła and two of John Paul II’s predecessors – a fact that is almost inevitable given the import and the size of the opening session, but interesting nonetheless. Given that John Paul II was in failing health for many years prior to his death, and all the challenges this presented and sympathy that he was unable to retire, it was to great surprise that Bishop Ratzinger at age 78 emerged from the smoky conclave as his successor. The Church has reacted very bullishly to a number of issues which concern at least a large minority of modern Catholics the world over; female clergy, contraception – especially in areas where the church is strongest and AIDS is most prevalent – and homosexuality. I cannot claim to speak for all Catholics, and I wouldn’t dream of doing so. I know that there will be many Catholics in Scotland and across the world who stick rigidly to biblical doctrine and dogma as interpreted by the Catholic Church and disagree fundamentally with where I think the Catholic Church should be. Not least Cardinal Keith Patrick O’Brien, who I’ll allow is a lovely man in person but with whom I fundamentally disagree on equal marriage, to the extent that he alienates people like me from the Church. Let us also not eulogise either John Paul II and Benedict XVI without at least mentioning how slow they were to react to disgusting allegations of child abuse in the Catholic Church, or how the Catholic Church, under their direction protected criminal priests and other clergy at the expense of the people it should have been protecting; the children. Or the fact that cover-ups are still in place and that, but for the tenacity of victims and supporters, some of these cover-ups would remain in perpetuity as guilty priests go unexposed. When Joseph Ratzinger was appointed, I admit to a degree of impatience with the conclave of cardinals. It was apparent they had elected to travel the predictable and safe route of appointing a known quantity. There was nothing to fear from a Ratzinger appointment, and given his health had been less than robust since the 1990s, he was unlikely to pursue change and progress with any degree of vehemence. And somehow he didn’t evoke the same warm response his predecessor John Paul II could take for granted. Perhaps that is because I had only known one pope in my lifetime. Those older than me are probably more pragmatic, having seen the passage of successive popes. Or maybe having travelled the theology route as opposed to the clerical route to the top of the Catholic Church, Joseph Ratzinger was a different type of pope from Karol Wojtyla. Regardless, he was different, and didn’t quite hit the heights of expectation. I am glad that the Pope has merely decided to retire, because I have realised whilst typing that this isn’t much of an obituary, my being critical of him in so many respects. However, Pope Benedict XVI has served his appointment to the best of his ability, and with faith and a belief in his ministry. I might not necessarily agree with him unquestioningly, but I cannot deny his long commitment to the Catholic Church. And despite my initial reluctance to his elevation to the papacy I still went along, with many others, to the papal mass in Bellahouston in 2010. So, Papa, thanks for your long service, enjoy your retirement and best wishes for reinvigorated health freed from the weight of your ministry. And to the conclave of Cardinals, a plea; recognise our impatience with the stagnation of the Church and address our hopes when choosing our next pope for us. Proceed with the intention to embrace a Brave New World and consider, perhaps, when choosing, that the Church is at its strongest and growing in areas of the African and South American continents and contemplate choosing a candidate from their wealth of fantastic representatives.